Barbecue or barbeque (with abbreviations BBQ, Bar-B-Q, and Bar-B-Que, diminutive form barbie used chiefly in Australia, New Zealand, and the United Kingdom, and called Braai in South Africa) is a method and apparatus for cooking food, often meat. It uses the heat and hot gases of a fire, smoking wood, or hot coals of charcoal and may include application of a marinade, spice rub, or basting sauce to the meat. The term can refer to foods cooked by this method, to the cooking apparatus itself, or to a party that includes such food. Barbecue is usually cooked in an outdoor environment heated by the smoke of wood or charcoal. Restaurant barbecue may be cooked in large brick or metal ovens specially designed for that purpose. Alternatively, an apparatus called a "smoker" with a separate fire box may be used. Hot smoke is drawn past the meat by convection for very slow cooking. Barbecue has numerous regional variations in many parts of the world. Notably, in the Southern United States, practitioners consider barbecue to include only indirect methods of cooking over hardwood smoke, with the more direct methods to be called "grilling." 3 History in the U.S.
A barrel - shaped barbecue on a trailer at a block party in Kansas City. Pans on the top shelf hold hamburgers and hot dogs that were grilled earlier when the coals were hot. The lower grill is now being used to cook pork ribs and "drunken chicken" slowly. Barbecue is reminiscent of the first forms of cooking over an open fire. The gathering of people around a barbecue, whether at home or at a larger more public occasion, generally is experienced with pleasure and harmonious companionship and a certain feeling of harmony with other people and nature. Barbecue is a method and apparatus for cooking food, often meat, with the heat and hot gases of a fire, smoking wood, or hot coals of charcoal. It may also include application of a marinade, spice rub, or basting sauce to the meat. The techniques used in barbecue are hot smoking and smoke cooking. Hot smoking is where the meat is cooked with a wood fire, over indirect heat, at temperatures between 120 °F (49 °C) and 180 °F (82 °C), and smoke cooking is cooking over indirect fire at higher temperatures. Unlike cold smoking, which preserves meat and takes days of exposure to the smoke, hot smoking and smoke cooking are cooking processes. While much faster than cold smoking, the cooking process still takes as many as 18 hours. The long, slow cooking process leaves the meat tender and juicy. An important ingredient in barbecue is the wood. The wood smoke flavors the food, with different woods imparting different flavors, so availability of various woods for smoking influences the taste of the barbecue in different regions. The last, and in many cases optional, ingredient is the barbecue sauce. Sauces run the gamut from clear, peppered vinegars to thick, sweet, tomato and molasses sauces, from mild to painfully spicy. The sauce may be used as a marinade before cooking, applied during cooking, after cooking, or used as a table sauce. An alternate form of barbecue sauce is the dry rub, a mixture of salt and spices applied to the meat before cooking. The origins of both the activity of barbecue cooking and the word itself are somewhat obscure. Most etymologists believe that "barbecue" derives ultimately from the word barbacoa found in the language of the Taíno people of the Caribbean. The word translates as "sacred fire pit" and is also spelled barbacoa. The word describes a grill for cooking meat, consisting of a wooden platform resting on sticks. There is ample evidence that both the word and cooking technique migrated out of the Caribbean and into other languages and cultures, with the word moving from Caribbean dialects into Spanish, then French, and English. The Oxford English Dictionary cites the first recorded use of the word in the English language in 1697 by the British buccaneer William Dampier. The word evolved into its modern English spelling of "barbecue" and may also be found spelled as "barbeque," "bar-b-q." or "bbq." The origins of American barbecue date back to colonial times, with the first recorded mention in 1610, and George Washington mentions attending a "barbicue" in Alexandria in 1769. As the country expanded westwards along the Gulf of Mexico and north along the Mississippi River, barbecue went with it. The first ingredient in the barbecue tradition was the meat. Pigs came to the Americas with the Spanish explorers, and quickly turned feral. This provided the most widely used protein used in most barbecue, pork ribs, as well as the pork shoulder for pulled pork. Barbecue in its current form grew up in the poor South, where both black and white cooks learned to slow roast tough cuts of meat over fire pits to make them tender. This slow cooking over smoke leaves a distinctive line of red just under the surface, where the myoglobin in the meat reacts with carbon monoxide from the smoke, and the smoky taste essential to barbecue. These humble beginnings are still reflected in the many barbecue restaurants that are operated out of hole-in-the-wall locations, by individualists with shady reputations; the "rib joint" is the purest expression of this. Many of these will have irregular hours, and remain open only until all of a day's ribs are sold; they may shut down for a month at a time as the proprietor goes on vacation. Despite these unusual traits, rib joints will have a fiercely loyal clientèle. Barbecuing encompasses two distinct types of cooking techniques. One type is grilling over direct heat, usually a hot fire for a short time (minutes). Grilling may be done over wood or charcoal or even gas. The other technique is cooking by using indirect heat or low-level direct radiant heat at lower temperatures and longer cooking times, often with smoke. The distinction between smoking and grilling is the heat level and the intensity of the radiant heat; indeed, smoking is often referred to as "low and slow." Additionally, during grilling, the meat is exposed to the open air for the majority of the time. 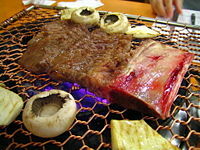 The choice and combination of woods burned result in different flavors imparted to the meat. Woods commonly selected for their flavor include mesquite, hickory, maple, guava, kiawe, cherry, pecan, apple, and oak. Hard woods such as hickory, mesquite, pecan, and the different varieties of oak impart a strong smoke flavor. Stronger-flavored woods are used for pork and beef, while the lighter-flavored woods are used for fish and poultry. More exotic smoke generating ingredients can be found in some recipes; grapevine adds a sweet flavor, and sassafras, a major flavor in root beer adds its distinctive taste to the smoke. Woods to avoid include conifers. These contain resins and tars, which impart undesirable resinous and chemical flavors. If these woods are used, they should be burned in a catalytic grill, such as a rocket stove, so that the resins and tars are completely burned before coming into contact with the food. Cooking with charcoal is a more manageable approximation of cooking over a wood fire. Charcoal cooking does not impart the rich flavor of cooking over hardwoods, but is cheap and easy to purchase in sizes appropriate for close proximity cooking in typical home grills. Many barbecue aficionados prefer charcoal over gas (propane) for the authentic flavor the coals provide. Charcoal cannot be burned indoors because poisonous carbon monoxide (CO) is a combustion product. Carbon-monoxide fumes may contribute to the pink color taken on by barbecued meats after slow cooking in a smoker. 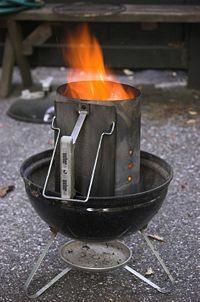 A charcoal chimney-starter is an inexpensive and efficient method for quickly obtaining a good charcoal fire. A few pages of newspaper are wadded up underneath the chimney to start the fire. Other methods are to use an electric iron to heat the charcoal or to soak it with aliphatic petroleum solvent and light it in a pyramid formation. Charcoal briquettes pre-impregnated with solvent are also available. Once all coals are ashed over (generally 15 to 25 minutes, depending on starting technique), they can be spread around the perimeter of the grill with the meat placed in the center for indirect cooking, or piled together for direct cooking. Water-soaked wood chips (such as mesquite, cherry, hickory, or fruit trees) can be added to the coals for flavor. As with wood barbecuing, the temperature of the grill is controlled by the amount and distribution of coal within the grill and through careful venting. For long cooking times (up to 18 hours), many cooks find success with the minion method, usually performed in a smoker. This involves putting a small number of hot coals on top of a full chamber of unlit briquettes. The burning coals will gradually light the unlit coals. By leaving the top air vent all the way open and adjusting the lower vents, a constant temperature of 225 degrees F can easily be achieved for up to 18 hours. The Japanese-style kamado cooker utilizes lump charcoal for fuel. The kamado is made from ceramic and can be adjusted to cook for more than 30 hours on a single load of fuel, the heat being retained in the ceramic walls, radiating into the food. 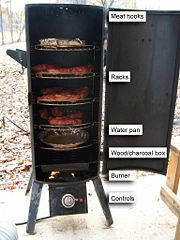 There is no need to use water pans or replenish fuel during the cook, as is the case with steel water smokers. The very small amount of air needed to keep a ceramic cooker going at low temperature helps maintain a moist environment, whereas in a steel smoker, steam must be added from a water pan over the briquettes to keep the food from drying out. Grilling with natural gas or propane is a step further removed from cooking over a wood fire. Despite this, and the higher cost of a gas grill over a charcoal grill, many people prefer cooking over a gas flame. Gas grills give very consistent results, although some charcoal and wood purists argue that it lacks the flavors available only from cooking with charcoal. Advocates of gas grills claim that gas cooking lets you "taste the meat, not the heat" because it is claimed that charcoal grills may deposit traces of coal tar on the food. Many grills are equipped with thermometers, further simplifying the barbecuing experience. However, propane and natural gas produce a "wet" heat (water vapor) that can change the texture of foods cooked over such fuels. Added wood-smoke flavor can be imparted on gas grills using water-soaked wood chips placed in an inexpensive smoker box (a perforated metal box), or simply a perforated foil pouch, under the grilling grate and over the heat. Using such smokers on quick-grilled foods (steaks, chops, burgers) nearly duplicates the effects of wood and charcoal grills, and they can actually make grilling some longer-cooked foods, such as ribs, easier, since the "wet" heat makes it easier to prevent the meat from drying out. Gas grills are significantly more expensive due to their added complexity. They are also considered much cleaner, as they do not result in ashes, which must be disposed of, and also in terms of air pollution. Proper maintenance may further help reduce pollution. Most barbecues that are used for commercial purposes now use gas for these reasons. There have been a number of designs for barbecues that use solar power as a means of cooking food. The device usually involves the use of a curved mirror acting as a parabolic reflector, which focuses the rays of the sun on to a point where the food is to be heated. Smoking can be done with wood or charcoal, although many common commercial smokers use a gas, such as propane, to heat up a box of wet wood chips sufficiently to cause smoke. The heat from the propane fire helps cook the meat while the smoke adds its unique and delicious flavor. During smoking, the BBQ lid or smoker door is closed, making a thick dense cloud of smoke to envelope the meat. The smoke must be able to move freely around the meat and out of the top of the apparatus quickly; otherwise, foul-tasting creosote will build up on the meat, giving it a bitter flavor. Smoked meats such as pork exhibit what is known as a smoke ring: a thin pink layer just under the surface which is the result of the smoke interacting with the water in the meat. Barbecue is primarily a source of protein. At its most generic, any form may be used, including beef, pork, lamb, poultry, fish, and seafood. The meat may be ground, as with hamburger, processed into sausage or kebabs. Vegetarian alternatives to meat, such as soyburgers and mushroom caps, are often prepared similarly. The meat may be marinated or rubbed with spices before cooking, basted with a sauce or oil before and/or during cooking, and/or flavored in numerous ways after being removed from the heat. Barbecue may be accompanied by vegetables (also barbecued or served separately) and bread, producing a balanced meal. The grilling of meat can also form potentially carcinogenic compounds. It is believed that the air quality associated with barbecue can be hazardous. Barbecuing has been found to be a small but significant source of particulate air pollution. Therefore, the Maryland Department of the Environment in the United States regulates the installation of non-residential charbroilers or pit barbecues with a total cooking area that is greater than 5 square feet (0.46 m²).. The word "barbecue" can be used to refer to a social gathering where food is served, usually outdoors in the early afternoon. In the southern U.S., outdoor gatherings are not typically called "barbecues" unless barbecue itself will actually be on the menu. The U.S. is known for its barbecues. Much of the population barbecues every year. One of the most frequent days for barbecuing is Independence Day, celebrated on July Fourth. There are hundreds of barbecue competitions every year, from small local affairs to large festivals that draw from all over the region. The non-profit Kansas City Barbeque Society, or KCBS, sanctions over 300 barbecue contests per year, in 44 different states. Despite the "Kansas City" name, the KCBS judges all styles of barbecue, which is broken down into classes for ribs, brisket, pork, and chicken. Memphis in May World Championship Barbecue Cooking Contest may be the largest, and there is even a contest dedicated to sauces, the Diddy Wa Diddy National Barbecue Sauce Contest. 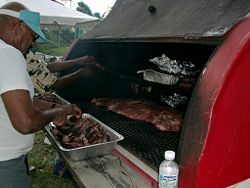 In the United States, especially the southeastern region, barbecue refers to a technique of cooking that involves cooking meat for long periods of time at low temperatures over a wood fire; often this is called "pit barbecue," and the facility for cooking it is the "barbecue pit." This form of cooking adds a distinctive smoky taste to the meat; barbecue sauce, while a common accompaniment, is not required for many styles. The core region for barbecue is the southeastern region of the United States, an area bordered on the west by Texas and Oklahoma, on the north by Missouri, Kentucky, and North Carolina, on the south by the Gulf of Mexico, and on the east by the Atlantic Ocean. While barbecue is found outside of this region, the thirteen core barbecue states contain 70 of the top 100 barbecue restaurants, and most top barbecue restaurants outside the region have their roots there. Often the proprietors of southern-style barbecue establishments in other areas originate from the southeast. In the southeast, barbecue is more than just a style of cooking, but a subculture with wide variation between regions, and fierce rivalry for titles at barbecue competitions. Although regional differences in barbecue in the U.S. are blurring, as are many other aspects of U.S. regional culture, significant variations still exist. While the wide variety of barbecue styles makes it is difficult to break barbecue styles down into regions, there are four major styles. These are Memphis and Carolina, which rely on pork and represent the oldest styles, and Kansas City and Texas, which utilize beef as well as pork, and represent the later evolution of the original deep south barbecue. Pork is the most common protein used, followed by beef, often with chicken or turkey in addition. Mutton is found in some areas, such as Owensboro, Kentucky, and some regions will add other meats. Memphis barbecue is primarily ribs, which come "wet" and "dry." Wet ribs are brushed with sauce before and after cooking, and dry ribs are seasoned with a dry rub. Pulled pork, from the shoulder, is also a popular item, which is served smothered in a hot, sweet, tomato-based sauce. The Carolinas use primarily pork, both pulled and ribs, marinated in a peppery vinegar sauce before smoking. The pulled pork differs from Memphis pulled-pork in that the whole hog is used in the Carolinas. There, however, the consistency ends, as the sauces used vary widely. South Carolina sauce mixes ketchup and mustard with vinegar to make a unique orange-colored sauce. North Carolina varies from a clear vinegar sauce in the east, to a vinegar and ketchup sauce in the west. Kansas City has a wide variety in proteins, but the signature ingredient is the sauce. The meat is smoked with a dry rub, and the sauce served as a table sauce. Kansas City style sauce is thick and sweet (with significant exceptions) based on tomatoes and molasses. 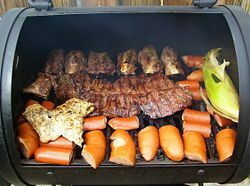 Texas-style barbeque usually uses mesquite or pecan wood as the fuel and always uses the indirect-heat method of cooking. Beef (primarily ribs and brisket) and pork are both acceptable meats; the recipes are varied. Texas sauces are tomato based, less sweet than Kansas City and spicier, and are not generally used during cooking, but are used as a table sauce. Texas also adds smoked sausages, adopted from local German and Mexican populations. Other regions of the core barbecue states tend to draw their influence from the neighboring styles, and often will draw from more than one region. Oklahoma barbecue, for example, combines elements of Texas, Kansas City, and Memphis barbecue, in addition to adding its own unique elements, such as smoked bologna sausage. Good southern barbecue is available outside of the core states; while far less common, the variety can be even greater. With no local tradition to draw on, these restaurants often bring together eclectic mixes of things such as Carolina pulled-pork and Texas brisket on the same menu. Canadian barbecue takes many influences from its American neighbor, but also takes influences from British, Irish, French, and Australian barbecue styles. The most common items grilled on a Canadian barbecue are chicken, burgers, ribs, steaks, sausages, and shish kebabs. As in the United States, barbecue competitions are quite common. Barbecue is popular in South America. Variations include the southern Brazilian churrasco and the Argentine asado. An asado on an open pit, an alternative desirable in good weather and with a large crowd of guests. Asado is a technique for cooking cuts of meat, usually consisting of beef alongside various other meats, which are cooked on a grill or open fire. Asado is quite popular in the Pampa region of South America, and it is the traditional dish of Argentina, Uruguay, Chile, and Paraguay. An asado can be made al asador or a la parrilla. In the first case a fire is made on the ground or in a fire pit and surrounded by metal crosses (asadores) that hold the entire carcass of an animal splayed open to receive the heat from the fire. In the second case, a fire is made and after the coals have formed, a grill (parrilla) is placed over with the meat to be cooked. The meat for an asado is not marinated, the only preparation being the application of salt before and/or during the cooking period. Also, the heat and distance from the coals are controlled to provide a slow cooking; it usually takes around two hours to cook an asado. Further, grease from the meat is not encouraged to fall on the coals and create smoke which would adversely flavor the meat, indeed in some asados the area directly under the meat is kept clear of coals. An asado also includes bread, a simple mixed salad of, for instance, lettuce, tomato, and onions, or it could be accompanied with verdurajo (grilled vegetables), a mixture made of potatoes, corn, onion and eggplant cooked on the parrilla and seasoned with olive oil and salt. Beer, wine, soda, and other beverages are common. Dessert is usually fresh fruit. In Brazil, churrasco is the term for a barbecue, similar to the Argentine asado, which originated in southern Brazil. Brazilian churrasco contains a variety of meats which may be cooked on a purpose-built churrasqueira, a grill or barbecue, often with supports for spits or skewers. 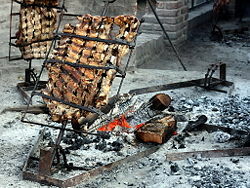 Portable churrasqueiras are similar to those used to prepare the Argentinian and Uruguayan asado, with a grill support, but many Brazilian churrasqueiras do not have grills, only the skewers above the embers. The meat may alternatively be cooked on large metal or wood skewers resting on a support or stuck into the ground and roasted with the embers of charcoal (wood may also be used, especially in the State of Rio Grande do Sul). Barbecue in the back garden. Barbecuing is a popular outdoor cooking and eating style, common in the United Kingdom and the Republic of Ireland. 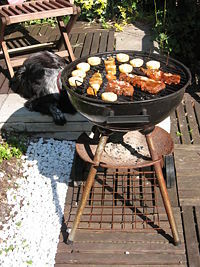 Many homes have a barbecue, usually located in the back garden. Most popular are steel-built "kettle" and range-style barbecues, with wheels to facilitate moving the barbecue. Due to the typically wet weather of the climate of the British Isles, during the autumn and winter, many British and Irish people store their barbecues in a garden shed or garage, although permanent brick barbecues are also common. The most popular foods cooked on a British-style barbecue are chicken, hamburgers, sausages, beef steaks, shish kebabs, and vegetarian soya or Mycoprotein based products. Such vegetarian products require extra attention due to their lower fat content and thus tendency to stick, as well as their weaker structure due to the manufacturing process of such foods. Less common food items include fish, prawns, lobster, halloumi (cheese), corn-on-the-cob, asparagus, pork fillets, pork patties, and pork or beef ribs. Similar to the United States, barbecue sauce is sometimes spread onto the meat while it is cooking. Barbecue in the UK is mostly influenced by traditional English, Scottish, and Welsh cuisines. However, as modern British cuisine as a whole is also heavily influenced by its multi-ethnic minority communities, Continental Western European and Mediterranean cuisines, and to a lesser extent, Middle Eastern, Asian, and Oriental cuisines may occasionally influence the food cooked at the British barbecue. For example, in addition to barbecue sauce, persillade may be put on top of the meat as a garnish. Overall, British barbecue is similar to a mix of American, Australian, German, and Mediterranean styles. In the Republic of Ireland, the Irish people have their own tradition of barbecue which is influenced by traditional Irish cuisine. In addition to meat and vegetables, potatoes, a staple in Irish cuisine, are also grilled. Germans are enthusiastic about their version of barbecue, grilling (Grillen), especially in the summertime. It is the one area of traditional home cooking that is a predominantly male activity. Germans grill over charcoal or, increasingly, gas, and grilled meats include all of the local sausage variations as well as steaks (especially marinaded pork steaks from the shoulder) and poultry. Regional festivals feature grilled items ranging from eel to trout, whole sides of pork or beef, chicken, and duck. Barbecue variations are also popular among the immigrant communities in Germany, with notable traditions of outdoor grilling in Germany developed by immigrants and visitors from the United States, Turkey, Greece, other Balkan States, and among the German-speaking immigrants from the states of the former Soviet Union. 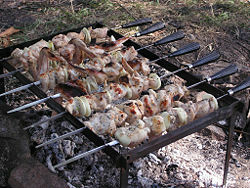 Barbecuing is popular in Mediterranean countries. It is influenced from traditional Mediterranean gourmet cooking; thus olive oil is a key part of the Mediterranean barbecue style. The most common items grilled are chicken, beef steaks, souvlakis also known as brochettes (small pieces of meat and sometimes vegetables grilled on a skewer), with other traditional Mediterranean ingredients. Often, barbecue items are garnished with various herbs and spices; basic persillade and variations are often put on top of the meat. 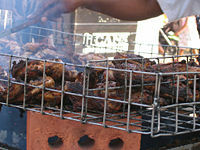 Jamaican jerk cooking is a form of barbecue. This method derives from Native cooking of the Taino and Caribs, with influences from African slaves. The Tainos would construct a grid of green sticks some distance above a smoldering fire of green pimento wood (that is, the wood of the allspice tree) in a shallow pit, place meat on the grid and cover it with pimento leaves to impart further flavor while trapping the smoke for maximum effect. Similarly the Caribs would construct makeshift grills of green sticks over an open fire to prepare jerkies and grilled meats. Today, a grill over an open fire with seasonings that include allspice (Jamaican pimento) and Scotch bonnet peppers suffices. 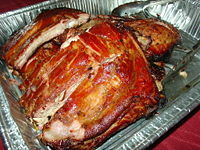 In Spanish-speaking islands of the Caribbean, such as Cuba, Dominican Republic, and especially Puerto Rico, Lechon is a common and extremely popular delicacy. Lechon consists of taking a whole pig, slicing it from the head to the rear from the underside, and slow-grilling the hog as it is turned on a rod roasted over charcoal. In southern China, pork barbecue is made with a marinade and cooked in long, narrow strips. This form of barbecue is known as char siu. Char siu literally means "fork burn/roast" after the traditional cooking method for the dish: Long strips of seasoned boneless pork are skewered with long forks and placed in a covered oven or over a fire. The meat, typically a shoulder cut, is seasoned with a mixture of honey, five-spice powder, fermented tofu, dark soy sauce, hoisin sauce, and sherry or rice wine (optional). These seasonings turn the exterior layer of meat dark red, similar to the "smoke ring" of American barbecues. 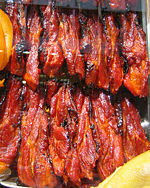 Maltose may be used to give char siu its characteristic shiny glaze. Outdoor barbecues (usually known simply as BBQ) are popular among Hong Kong residents on short trips to the countryside. These are invariably coal-fired, with meat (usually beef, pork, sausage, or chicken wing) simply marinated with honey, then cooked using long, hand-held forks. Barbecue is very popular in Japan as part of outdoor activities. Normally more vegetables and seafood are incorporated than in the US, and soy sauce or soy-based sauces are commonly used. Yakitori (焼き鳥 やきとり, Yakitori), "grilled bird," is a Japanese type of skewered chicken. It is made from several bite-sized pieces of chicken meat, or chicken offal, skewered on a bamboo skewer and barbecued, usually over charcoal. Diners ordering yakitori usually have a choice of having it served with salt (and sometimes lemon juice) or with tare sauce, which is generally made of mirin, sake, soy sauce, and sugar. The sauce is applied on the skewered meat and is grilled until delicately cooked and is served with the tare sauce as a dip. It is the Japanese version of shish kebab. Bulgogi (불고기) is thinly sliced beef (and sometimes pork or chicken) marinated in soy sauce, sesame oil, garlic, and chili pepper, cooked on a grill at the table. Bulgogi literally means "fire meat." It is a main course, and is therefore served with rice and side dishes such as Kimchi. The more common "Korean BBQ" is called galbi (갈비), which is marinated pork or beef ribs; a variation using seasoned chicken is called (Dakgalbi). 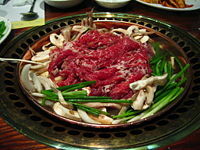 It is sliced thicker than bulgogi and cooked on a metal plate over charcoal in the center of the table. Nomadic Mongolians have several barbecue methods, one of them called khorkhog. They first heat palm-sized stones to a high temperature over the fire and sandwich several layers of lamb or goat and stones in a large urn. The Mongolians believe that the heat and fat have beneficial or even healing effects, and after the cooking is finished they pass the stones around from hand to hand for good health. Khorkhog is a popular dish in the Mongolian countryside, but not usually served in restaurants. The "Mongolian barbecue" often found in restaurants is a style of cooking falsely attributed to the mobile lifestyle of nomadic Mongolians, but is neither Mongolian nor barbecue. Having its origins in Taiwan, Mongolian barbecue is a restaurant style of stir-frying meats and vegetables over a large, round, solid iron griddle. Satay served with peanut sauce, cucumber and onion. Satay is popular in several Southeast Asian countries: Malaysia, Singapore, Indonesia, and the Philippines. It consists of pieces of meat skewered on a bamboo stick; the more authentic version uses skewers from the midrib of the coconut leaf. Diced or sliced chicken, goat, mutton, beef, pork, or fish are grilled or barbecued over a wood or charcoal fire, then served with various spicy seasonings. The meat is marinated in a mixture of spices similar to a curry mix, of which turmeric is a compulsory ingredient which gives the dish its characteristic yellow color. It may be served with a spicy peanut sauce dip, or peanut gravy, slivers of onions and cucumbers, and ketupat (rice cakes). In the Philippines, Lechon is a centerpiece of the main cultural diet. It is extremely rare for any celebratory occasion to lack lechon. Filipino lechon is made similarly to the same fashion as in the Spanish-speaking islands of the Caribbean. The hog is cut, slicing it from the head to the rear from the underside, and slow-grill as it is turned on a rod. Even though the Spanish-speaking islands of the Caribbean and the Philippines do not share a common language, it is still referred to with the same pronunciation. This may be in due to both regions being ruled by Spain for many centuries. Mangal (Turkish) is the act of grilling meat on coals outdoors, and also known as "on the fire." A typical mangal meal will consist of grilled vegetables, shish kebabs of various kinds, and meatballs called köfte. Grilled chicken wings, chicken breasts, and offal are also common. Salads and other cold foods accompany the meal. Shish lik is an Arabian barbecued rack of lamb. Other typical Arabian barbecue includes beef steaks, chicken parts, Middle-Eastern kebab made from beef and lamb, hot dogs, and beef burger. There are various types of Persian-style, barbecued kabobs. The main type is koobideh kabob, which is seasoned ground beef that is skewered and barbecued outside on a charcoal flame. 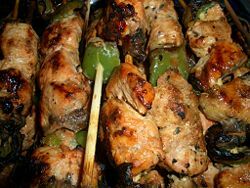 There is also a marinated chicken-kabob called jujeh kabab and a filet mignon steak-kabob, called kabob barg. All three main types of kabob are usually served with saffron rice and salad Shirazi, but may also be eaten with Middle-Eastern lavash flatbread. Similar to the traditional Persian cuisine jujeh kabab is Shish taouk. This is a traditional Turkish shish kebab, and can also be found in Syrian and Lebanese cuisines. It is very popular in Israel from ritual dietary considerations, where it is called shipudei pargiyot ("spring chicken on a skewer," Hebrew: שיפודי פרגיות) in which cubes of chicken are skewered and grilled. Common marinades are based upon yogurt or a tomato puree, though there are many variations. Shish taouk is typically eaten with garlic paste toum. 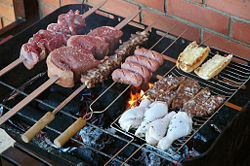 Braai (abbreviation of braaivleis, Afrikaans for "meat grill") originated with the Afrikaner people of Southern Africa. The tradition has since been adopted by South Africans of all ethnic backgrounds in Botswana, South Africa, Namibia, Zimbabwe, and Zambia. The braais are utilized in cooking almost daily by many South African families. Similar to a potluck party, the "Bring and Braai" is a grand social event (but still casual and laid-back) where family and friends converge on a picnic spot or someone's home (normally the garden or verandah) with their own meat, salad, or side dish in hand. A braai is a social occasion that has specific traditions and social norms. In black and white South African culture, women rarely braai (cook) meat at a social gathering, as this is normally the preserve of men. 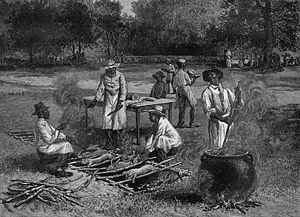 The men gather round the braai or braaistand (the fire or grill) outdoors and cook the food, while women prepare the pap, salads, desserts, and vegetables for the meal in the kitchen. The meal is subsequently eaten outside by the braai, since the activity is normally engaged in during the long summer months. The cooking of the meat is not the prerogative of all the men attending, as one person would normally be in charge. He will attend to the fire, check that the coals are ready, and cook the meat. Other men may assist but generally only partake in fireside conversation. The person in charge is known as the braaier (chef), and if his skills are recognized, could be called upon to attend to the braai at other occasions as well. In Australia and New Zealand, barbecues are a popular summer pastime. Public-use electric barbecues are common in city parks. While Australian barbecue uses similar seasonings to its American counterpart, smoking or sugary sauces are used less often; more commonly, the meat is marinated for flavor and then is cooked on a grill. The barbecuing of prawns is popular. Barbecues are also common in fundraising for schools and local communities, where sausages and onions are served on white bread with tomato sauce. These are most often referred to as "Sausage Sizzles." Barbecuing is popular in the Australasian, Melanesian, Micronesian, and Polynesian islands. 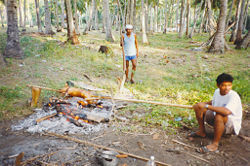 Every country has its own version, but some of the most legendary and continuously practiced examples of pit cooking can be found in the South Pacific. New Zealand’s Maori have the hangi, an ancient method of cooking food using super heated rocks buried in the ground in a pit oven. Prior to colonization and the introduction of metals and wire, food was laid out on clean sticks, bark, large leaves and other vegetation to minimize direct contact with the super hot rocks and reduce burning. Carved bowls and flat rocks were also used for this purpose. Leaves, sticks and vegetation were used to cover the food and to prevent crushing from the weight of the earth on top. Tahitians call this method hima’a, and a thousand miles away in the Marquesas Islands, there is the umu. As with many tropical islands' styles of cooking, the meat is glazed with sauce and decorated with fruits. ↑ C. Clark "Smoky" Hale, The Great American Barbecue and Grilling Manual. (Abacus Publishing, 2000, ISBN 0936171030). ↑ In his New Voyage Round the World, Dampier wrote: …And lay there all night, upon our Borbecu's, or frames of Sticks, raised about 3 foot from the Ground. ↑ Jake Adam York, "The Marrow of the Bone of Contention: A Barbecue Journal," storySouth, winter 2003. Retrieved February 23, 2009. ↑ Pocono Mountains Media Group, Barbecue grills are health hazard in several ways Pocono Record, April 09, 2007. Retrieved February 9, 2009. ↑ Jessie Milligan, Greening up' your backyard barbecue azcentral.com, July 6, 2007. Retrieved February 9, 2009. ↑ Maryland Department of the Environment, Air Quality General Permit to Construct Charbroiler and Pit Barbcue Fact Sheet Retrieved February 9, 2009. ↑ Tom Streissguth. Brazil in Pictures. (Minneapolis, MN: Lerner Publications, 2003, ISBN 0822519593), 54. ↑ Georg Mischler and Chuluun-Erdene Sosorbaram, Khorkhog All Mongolian Recipes: The Food of the Nomads. 2006. Retrieved February 13, 2009. ↑ Fran Osseo-Asare. Food Culture in Sub-Saharan Africa. (Greenwood Publishing Group, 2005, ISBN 0313324883), 81. This page was last modified on 12 May 2016, at 20:49.